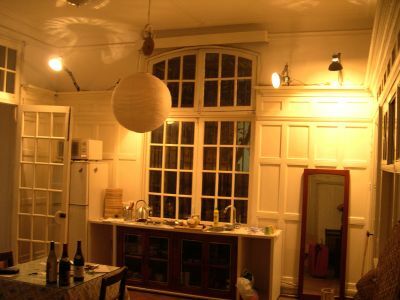 The post is focused on my first Old Shanghai house, nearly 13 years ago. The Shanghailander blog did not exist at this time, but this place was surely and inspiration. 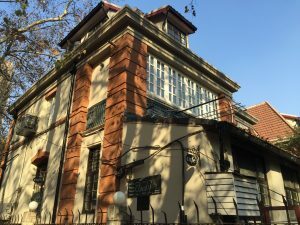 I reached Shanghai in early 2004, and after sharing a flat in a concrete block for 8 months, I just could not resist trying the Old Shanghai adventure, living in real Shanghai historic villa. The house was one of a series located in a small compound, at the corner of Route Pottier (today Baoqing Lu, an extension of HengShan Lu) and Rue Lafayette (today Fuxing Lu). The compound had clearly been of high luxury, with 3 level houses following a very European pattern. Houses had been subdivided after the communist takeover in 1949 and the lady upstairs had been living there ever since. The old tenants said that these houses had originally built by a German bank. After long search, I found a land registry from the early 1930s, showing that the land belonged to French Bank, Banque de l’Indochine, with its seat on the Bund. It was probably built to house the bank directors. No wonder it was luxurious! I never found the construction date, but from the location and the style I would guess late 1910s, or early 1920s. The style is very classical European from the pre WW1 period. The flat I moved in was on the ground floor, occupying about 70 sqm. It had 2 large rooms, one being a huge dining room with kitchen and the other one subdivided into a study and a sleeping room. The house entrance led to a corridor, opening to the doors rooms, including the one to my flat. The original bathroom and toilet, that had seen no changed and was still in common use for the house inhabitants (fortunately not for me, I had my own!). The first foreign tenant (2 years before me) had attempted to renovate the flat. Some parts were really well done like the elevated floor in the sleeping /study room. Unfortunately, the original fish bone wood floor in the dining room had been sanded with the wrong equipment and was seriously damaged. The kitchen / dining room of my time was certainly the dining room of the original house. The walls were covered with dark wood panels, as was the fashion of the day. The original setting must have been really dark, but fortunately, they had been painted white. 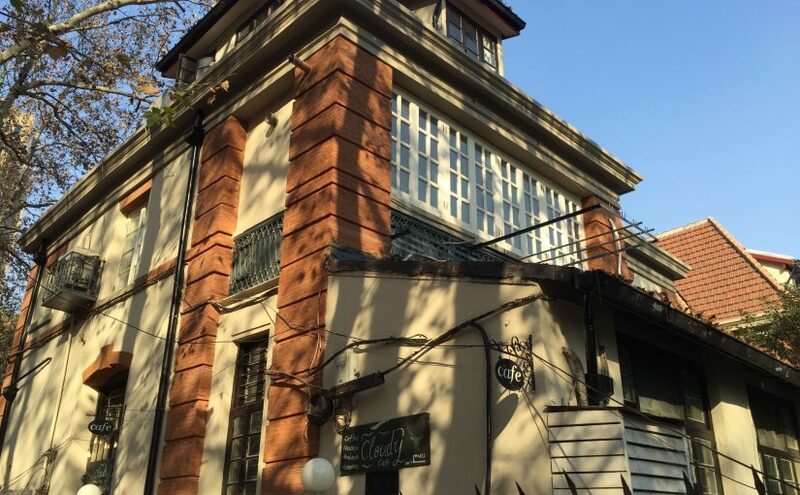 The large French style window overlooked Route Pottier (today Baoqing lu). This dining room had an interesting side door, enclosing a small double door, about 50 cm by 50 cm, 1 meter from the floor. This small door was certainly designed to deliver dishes from the kitchen to the dining room and then having a butler serving the master’s table. The room behind the door was originally a service room leading to the underground kitchen. It had been later used as a bedroom before being turned into my own bathroom, so the little door was not supposed to open anymore (though I did manage to do it once). This certainly gave a feeling of grandeur in the original setting, perfect for a bankers home. Next to this door was a display niche. 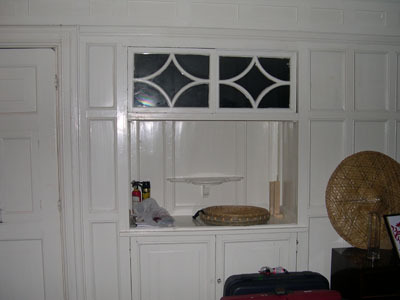 The original glass windows have disappeared for a long time but the railing and the upper cupboard door was still there. This was clearly the place to show some expensive pieces to the guest in the dining room. 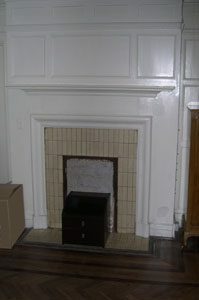 On the right hand side, opposite to the large window looking on the street was a door and a fireplace. The door was originally communicating to the next room (now the neighbors apartment) that had been walled up. Like most fireplaces in Shanghai, mine had been filled up with concrete after 1949. I dreamed about opening it up during my stay in that flat, but that is not allowed in Shanghai anymore. 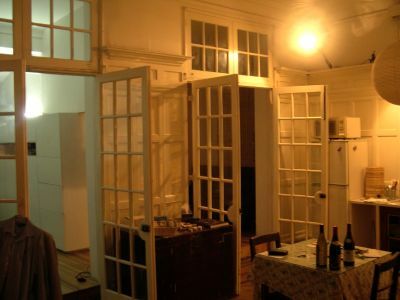 The back wall was opened with large french doors. They were really beautiful, but the small windows were nearly impossible to change if damaged, thus some of the windows were broken and left unrepaired. It must originally have been possible to open the top windows to give some fresh air, but after 60 years without being used, I was never able to do it. The study / sleeping room was divided in two parts with a very clever cupboard / wall left by the architect tenant. The original room had been extended from original construction, probably enclosing a terrace as the room was located half under the 2nd floor and half under it’s own little extension roof. Insulation was very poor and it was extremely cold in the winter (to bad I only noticed that when winter came). There was door from this room to the garden, which was very large and must have originally very nice. Unfortunately, people living in the house never really maintained it and it became half jungle and half junk yard with people dropping all kind of rubbish in it (including an old bath tab). Avenue Pétain (today Hengshan Lu) and Route Pottier (today Baoqing Lu) is a major way into Shanghai and (further down) became a major entertainment street, thus the road in front of my flat was a 24 hours traffic jam. With taxis and buses honking at any time of the day and night, it was really difficult to sleep. Along with the cold, it made it impossible to stay and I happily left after my first year, moving to a flat on Route Kauffman (today Anting lu) where I stayed for 11 years. The flat on Route Pottier has now been turned into a cafe. Although it still has an atmosphere, many of the original parts have been removed.